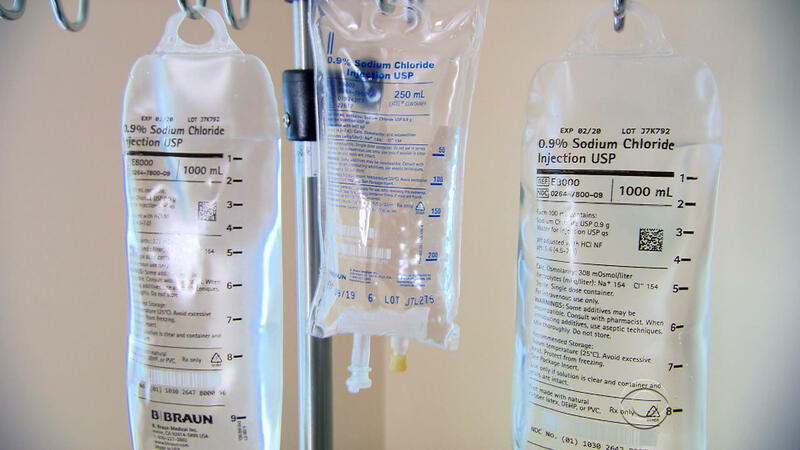 New research calls into question what's in those IV bags that nearly every hospitalized patient gets. Using a different intravenous fluid instead of the usual saline greatly reduced the risk of death or kidney damage, two large studies found. "We've been sounding the alarm for 20 years" about possible harms from saline, said Dr. John Kellum, a critical care specialist at the University of Pittsburgh. "It's purely inertia" that prevents a change, he said. IVs are one of the most common things in health care. They are used to prevent dehydration, maintain blood pressure or give patients medicines or nutrients if they can't eat. Administering IV fluids is "the first thing we do -- we use an IV, we hang an IV and that's how we start taking care of you," Régine Villain, who manages supplies at NYU Langone Health, told CBS News last fall. Other IV solutions called balanced fluids include saline but also contain potassium and other things that make them more like plasma, the clear part of blood. They're widely used in Europe and Australia. Since there are about 30 million people hospitalized in the U.S. alone each year, "there are tens or hundreds of thousands of patients who would be spared death or severe kidney problems by using balanced fluids instead of saline," said one study leader, Vanderbilt's Dr. Matthew Semler. Baxter makes up more than 43 percent of the United States' IV solution market, and earlier this year the company told CBS News they produce "tens of millions of sterile IV solutions" every year. "It's just really nerve-racking to think about not being able to have those bags available to the patient," Villain said about a month after the hurricane hit. Baxter told CBS News in January that production has resumed since the restoration of its power grid, but the company was having to deal with a three-month backlog.